Guest post by Abigayle Brown. 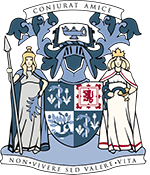 Abigayle has been carrying out a placement with us as part of her Museum Studies course at the University of Glasgow. During my placement working with the collection catalogue here at the RCPSG, I have been fortunate enough to research and handle various objects from across the medical and surgical disciplines. 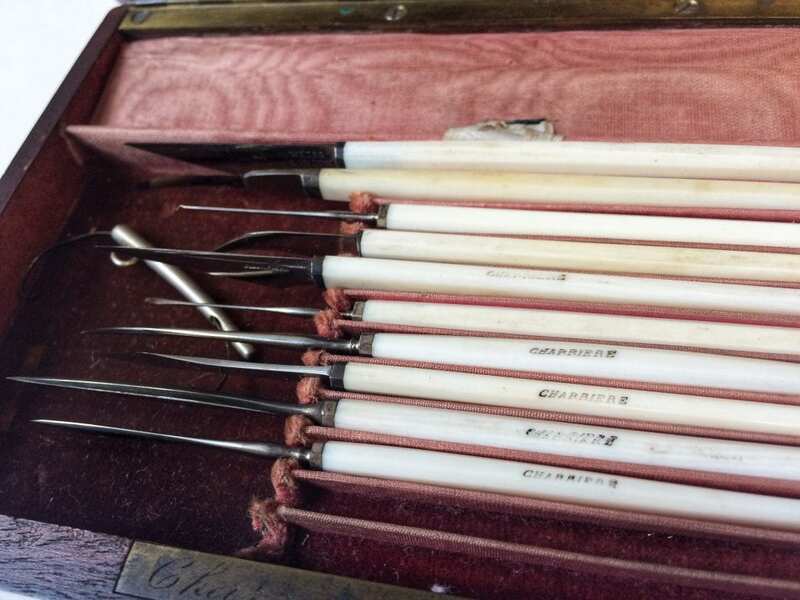 Some objects that caught my eye (ahem) are part of the small but mighty collection of ophthalmic instruments that provide insight into the history and progress of eye surgery across the decades. Many of these instruments were made by Charrière, a surgical instrument maker in Paris. The workshop’s namesake, JFB Charrière (1803-1876), was born and raised in Switzerland, and relocated to Paris aged 13 to begin his training as an apprentice Cutler making knives and tools. He quickly learned his trade and opened up his own workshop around 1820. His designs were informed by observing the practice of one of Paris’ top surgeons, Guillaume Dupuytren, chief surgeon at the Hotel-Dieu Hospital. Depuytren brought Charrière to the hospital each morning to watch his surgeries and post-mortems so he could better understand the use of instruments (Casey et al. 2002). Charrière was well-regarded across Europe as an expert surgical instrument maker, and many of his apprentices became renowned surgical instrument makers in their own right (see examples of his former apprentice Mathieu’s work here). 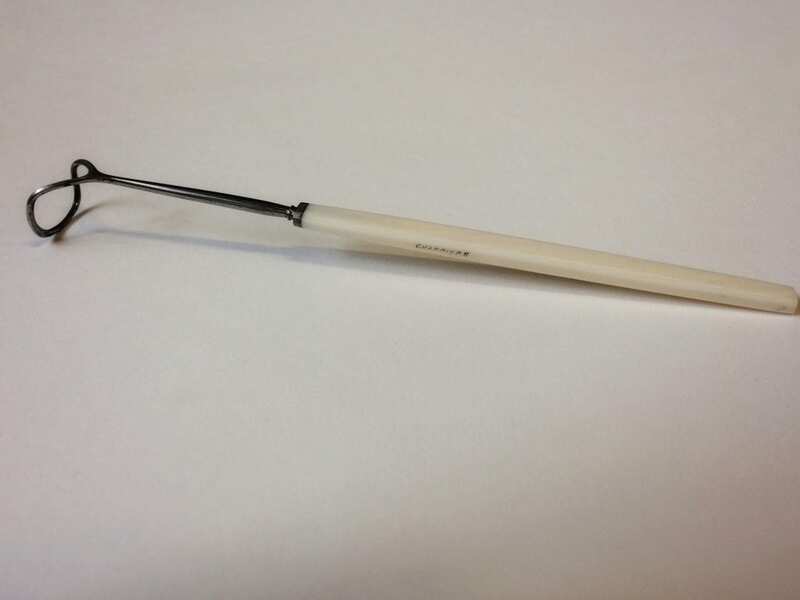 Although Charrière produced surgical instruments for use in various different procedures, the College holds instruments mostly for use in eye surgery, particularly, cataract removal surgery. Cataract surgery has ancient beginnings. The earliest recorded description is found in ‘Sushrita Samhita, Uttar Tantra’ that was published in 600 BCE (Harbin, 2016) which describes the couching technique. Couching does not involve the removal of the cloudy cataract; rather, the cataract is dislodged from the visual axis with a needle. Due to the high failure risk, couching is no longer widely trusted as a procedure today; however, it is still practiced in some Sub-Saharan African countries. 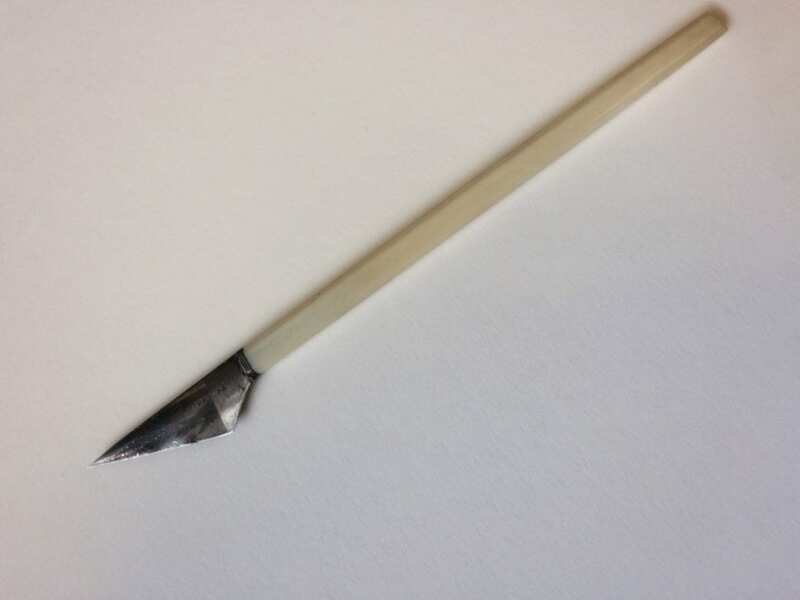 In the era when many of these objects were used, a technique pioneered by Jacques Daviel was gaining popularity: extracapsular cataract extraction. After a couching procedure failed, Daviel reported the first successful ECCE in 1747. For the ECCE procedure, Geetha Davis (2016) writes that ‘a large corneal incision (more than 10 mm) [was made], puncturing the lens capsule, expressing the nucleus, and then extracting the lens cortex by curettage’. The procedures were generally successful: in 9 years, Daviel reported that he performed 434 ECCEs with only 50 failures (Jaffe, 1998). However, with the procedure, there were still the pervading risks of infection and wounds healing poorly due to lens remnants still present in the eye, and couching was still practiced until the second part of the 19th century (Jaffe, 1998). In modern times, phacoemulsification (or ‘phaco’) is generally used for cataract removal. This is where a high-frequency ultrasound device breaks down the lens into fragments, with these pieces removed via a suction device. Phaco is performed with small incisions rather than the larger openings required for ECCE, which promotes faster healing and reduces the risk of complications that were more common in the past.